Elderly people and those with a history of bleeding disorders have been warned of the risk of taking certain types of anti-depressants. Experts say a group of anti-depressants called selective serotonin re-uptake inhibitors or SSRIs may predispose some people to internal bleeding. Writing in the Drug and Therapeutic Bulletin, they said the drugs should not be given to 'at risk' groups. The Department of Health said clearer warnings were being considered. Over 12 million prescriptions for SSRIs are written each year. Around four million of these are given to elderly people. Researchers from the Consumer's Association reviewed three studies where patients had taken SSRIs. One study of 12,000 people in the UK found that those who suffered gastrointestinal bleeding were three times more likely to have been prescribed SSRIs during the previous 30 days, compared to other patients. 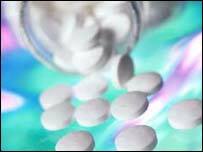 The risks were even greater for those who took aspirin along with SSRIs. They were seven times more likely to have suffered gastrointestinal bleeding. The researchers analysed the findings from another study of 300,000 people in Canada. All of those who took part in the study were over the age of 65 and all were taking anti-depressants. The researchers divided the study participants into those who were taking SSRIs and those on other anti-depressants. They found that those on SSRIs had a slightly higher risk of gastrointestinal bleeding compared to others. The risks were greatest for patients over the age of 80. They were almost 50% more likely to suffer gastrointestinal bleeding if they were taking SSRIs compared to other patients. The researchers said doctors should avoid prescribing SSRIs to people in 'at risk' groups. "On current evidence, we suggest that SSRIs should be avoided if possible, or used with caution, in patients aged over 80 years, those with prior upper gastrointestinal bleeding or in those also taking aspirin or another NSAID," they wrote. Joe Collier, editor of the Drug and Therapeutic Bulletin, said the risks of bleeding were small. "While the overall risk of gastrointestinal bleeding due to use of SSRIs is small, this risk is significantly increased among older patients or those with a history of gastrointestinal bleeding," he said. "The best course of action, therefore, would be to limit use of these anti-depressants in 'at risk' patients." A spokesman for the Department of Health said current warnings could be strengthened. "Product information for all SSRIs already contains warnings about the possible increased risk of bleeding, including gastrointestinal bleeding, and advises caution when used in combination with other drugs that cause bleeding, such as NSAIDs. "Strengthened warnings about the risk of gastrointestinal bleeding are being considered by the SSRI Expert Working Group." Last December, doctors were told not to prescribe the majority of SSRIs to children amid fears they could make young people suicidal. The Medicines and Healthcare products Regulatory Agency studied the latest evidence on these drugs. They concluded that the risks outweighed the benefits and said SSRIs should not be given to under 18s.